The inspiration for Spiced Candied Bacon struck as we were on a little escape to see Mumford and Sons in Providence, Rhode Island. I was at a loss of what to blog about this week as the show was this past Wednesday night, the night I usually cook something up for my blog. The bar at the hotel came to the rescue! We ordered a charcuterie plate that had some candied bacon. It was so good with a hint of spiciness. I just had to make it. For my husband’s birthday, our kids bought him a ticket to Mumford and Sons. The band is amazing live. Great harmonies, fantastic music and they just interact with the audience really well. A fabulous break from the dull winter. Mix the dry rub ingredients together. For this recipe I used 2 tablespoons of brown sugar but if you want it less sweet, you can reduce the sugar by up to a tablespoon. Or increase the spices. You just need to make sure you have enough rub for the bacon. Evenly coat the bacon and then bake on convection/fan. Keep an eye on this as you don’t want it suddenly to get overly crispy. It takes 5-10 minutes depending on the thickness. Set aside when done. As it’s probably not a good idea, though they wouldn’t protest, to just feed your kids bacon I made a southwest veg topping with panko crusted chicken and pepper jack cheesy potato and parsnip mash. I cooked up corn, mushrooms, onion, garlic and pepper with a bit of chicken stock, habenero flakes, lime zest, chili powder and cumin. Layer the mash, chicken, veg and the bacon and serve. I’ll definitely be making this bacon again. It’s so easy to do and would go with so many different kinds of dishes. Thank goodness for inspiration! A quick and easy recipe balancing heat and sweet for entrees and starters. Preheat the oven on convection/fan to 350F/175C. Mix the dry ingredients well then coat the bacon rashers. Lay out the bacon on a metal cooling rack and place that onto a baking rack. Bake for 5-10 minutes, keeping an eye on it so it doesn’t crisp up too much. Serve with entrees or starters, or by itself! With this week’s nor’easter we weren’t sure if the kids would be at school to participate in the national walkout to protest the mass shootings that keep happening in this country. We had a snow day on Tuesday but only a delay yesterday. Both kids at each of their schools joined in and I couldn’t be prouder. It’s so important for people, kids in particular, to find a way to get their point across in a mindful way. May they bring about the change that is so needed. I’d love to say that this storm was the last but we’re not going to be that lucky. Another one coming next week! So over this winter. I wanted to treat the family to a nice Saturday meal this past weekend that would have a side of Brussel sprouts as it’s a treat for my husband. I was puttering about on the Pinterest site and I saw many recipes for mustard and garlic pork and then white wine garlic pork and I thought, why not do it all? A couple of hours before dinner I did up the marinade for the pork loin. In a bowl that would fit the loin add a 1/3 cup of olive oil and 1/4 cup of white wine. Finely chop 4-5 cloves of garlic and a healthy handful of fresh thyme. Season with sea salt and pepper. Score the pork loin, season with sea salt and pepper and add it to the bowl and make sure the marinade coats the pork well. Set aside in the fridge for a couple of hours. When it was time to cook everything up I prepped the potatoes and parsnips for roasting. I really like them cut into disks. I find I get a lovely golden roast on the veg. Brush them with olive oil and season, again!, with sea salt and pepper. Preheat the oven to 375F/190C. Take the pork out of the fridge and put on a sheet to roast. Mix 2 tablespoons each of brown sugar and brown mustard and brush it onto the pork. Pop it into the oven along with the potatoes and parsnips. In a skillet add the remaining marinade and mustard mix. Bring to a low simmer and add a cup/8oz of chicken stock. Simmer slowly while the the pork cooks. As it reduces add more chicken stock if needed to balance out the flavours and to make sure you have enough sauce. You don’t want a watery sauce but you want enough to go round! As I mentioned my husband loves Brussel sprouts so I pan seared a bunch for him and our daughter. Our son and I don’t like them so I did up some green beans for us. When the pork is done let it rest for several minutes then slice and layer over the potatoes. Spoon the sauce over the pork and serve with veg and parsnips. This had so many delicious flavours that worked together. We all really enjoyed this meal. My son has taken to calling me shorty. Sigh, problem is that he isn’t wrong. But he thinks it is hilarious that he keeps growing like a weed and he is pretty much out pacing me in any high heels I may have. This ship has sailed. Even though we are in the throes of a hot summer I wanted to bake for the kids so they’d have a treat after they came back from camp. In keeping with the shorty theme and trying not to overheat the kitchen I decided to make shortbread. I had made this before but my camera setup wasn’t working, turns out I needed to change the batteries on the remote. That was easy to fix but I may be facing bigger issues with the camera. Fingers crossed I’m not but it’s been acting very strange. I love the camera so I want it to behave! Years ago my parents gave me a cookery book called “Cape Breton Pictorial Cookbook” and it was edited by Yvonne LeVert. It is a collection of recipes from the area and the influences from immigrants. 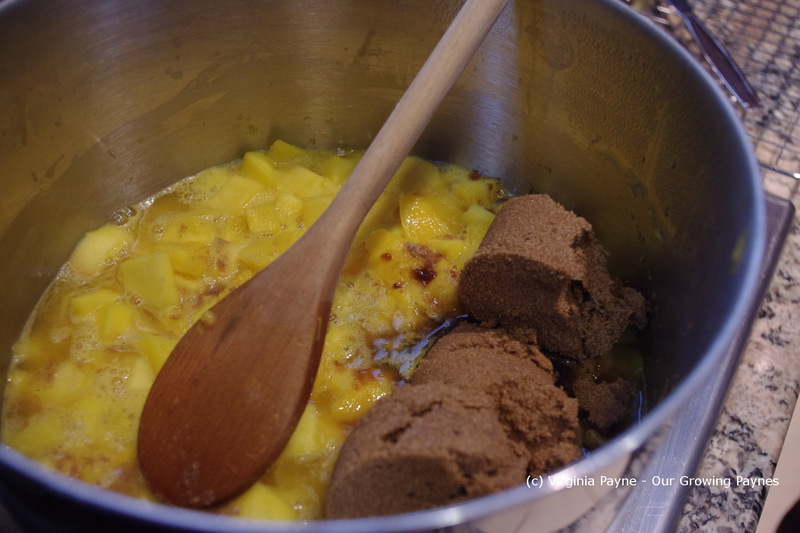 In a medium mixing bowl cream together a cup of softened butter and a 1/2 cup of brown sugar. This will take a few minutes. Add a teaspoon of vanilla and gradually add two cups of flour, mixing a bit in at a time. Tip out onto a floured surface. Knead to form a ball. Now the recipe said to roll out. Which seemed weird but hey I tried it. Wrong! You definitely need to chill for at least a half an hour. Preheat the oven to 300F/150C. On a well floured surface roll out the dough with a well floured rolling pin. Roll it out to about an 1/8″ of an inch. Use cookie cutters to cut out shapes you want and prick the tops with a fork. Bake 15-20 minutes until they are golden brown. Let cool and enjoy. 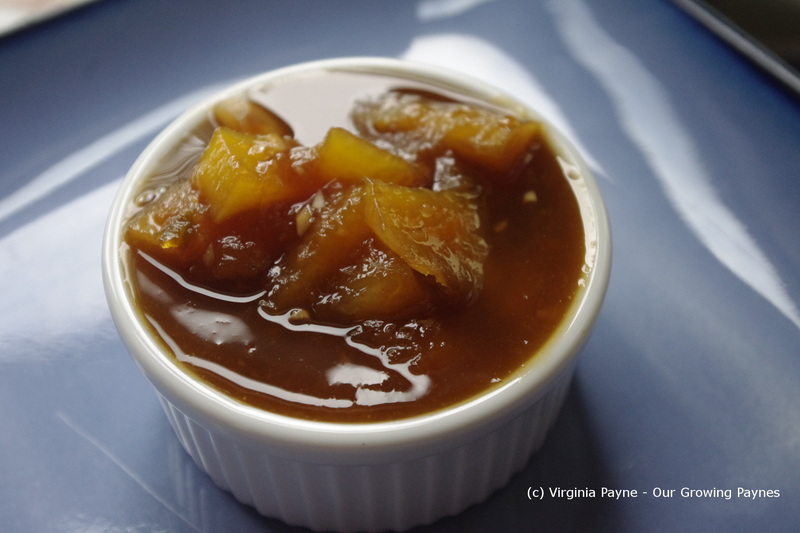 We’ve been enjoying it with the rhubarb ginger jam I made recently. The tart and sweet go really well together. As anyone with a garden knows, you have some great successes and some disappointing failures. Up until this year we have done really well with rhubarb. This year they are very anemic. We were able to freeze a few stalks but to do this jam I had to make a trip to the co-op to get more rhubarb. When I made the Victorian Sponge in England this year I used my MIL’s rhubarb ginger jam. It was absolutely delicious. I couldn’t wait for rhubarb season. Didn’t realise it wasn’t worth the wait. So we will have to figure that out for next year. I had about 6 stalks. Slice the rhubarb and add it to a saucepan. Add about a 1/4 cup of water and a tablespoon of lemon juice. Bring it to a simmer. 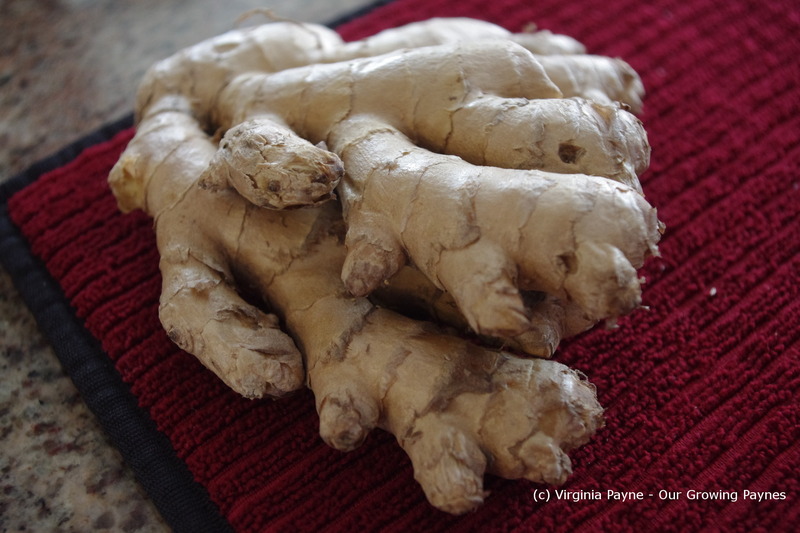 I wasn’t sure how much ginger I should use so I started with a piece about 1 1/2in/4cm by 1in/2.5cm. Grate into the sauce pan. As the rhubarb starts breaking down start adding brown sugar. To get the right balance with the heat of the ginger, the tartness of rhubarb, and the sweetness of the sugar, you need a lot of sugar. I used about a cup and a half for this. But add the sugar a bit at a time until the balance is right. The heat and tartness of the ingredients will be different each time. Simmer until the jam begins to thicken. This isn’t lasting long. By the time the weekend was over there was just enough left to process one jar. Guess I’ll be going back to the co-op! Usually when our anniversary rolls round we are up to our ears in some house project. If we were smart we’d do a trip or something fun like we did a few years ago. But then again the list won’t take care of itself! A big project is to redo the wrap around porch which means pulling up boards and lay new ones down as we go. When most of it was done it was time to get in a skip to get the trash removed. Silly me, I thought we could work on our foyer and walk in closet. Might as well fill the skip up! What was I thinking? Granted it will cross two more projects off the list. But we’re tired! In the days leading up to our anniversary my husband took a few days off to make a dent in the projects. When our anniversary rolled round we hit a wall where my husband had to handle things as I was unable to. I felt guilty! So I thought I should bake him a treat. It was the least I could do. 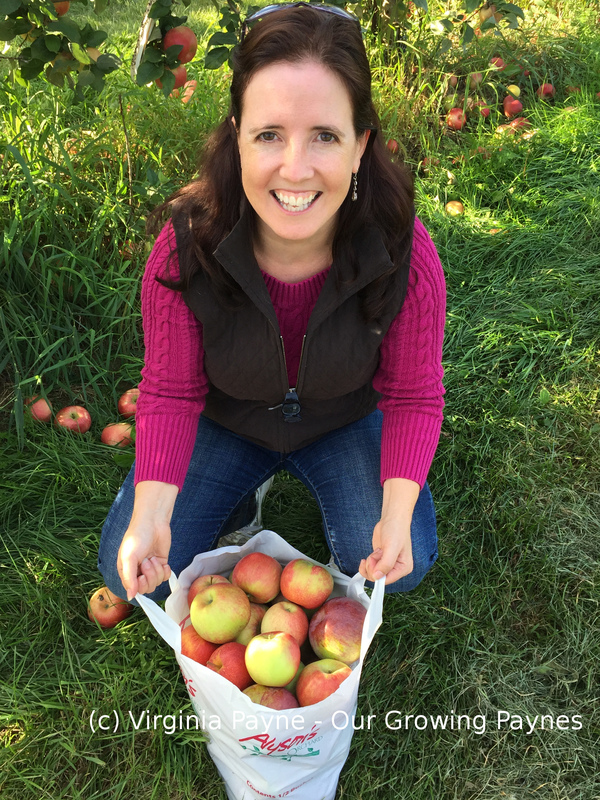 Given that we went apple picking and we have a ton of apples I had to pick something that would use some up. I have a great book called “Irish Traditional Cooking” by Darina Allen. In it is a recipe for Irish Apple Cake. I mostly followed it. Preheat the oven to 350F/175C. In a medium sized bowl add 2 cups of flour, 1/3 tsp baking powder, and 8 T of butter. You want the butter at room temperature so you can blend the ingredients. With a pastry fork or your hands work the ingredients together until it looks like breadcrumbs or small beads. Mix in half a cup of sugar then add one beaten egg. You will need 1/2 to 2/3 cup of milk. Gradually add a little bit of milk at a time until the dough is soft and incorporated. This dough will be a pain to work with as it is wet and sticky. Flour your hands and rolling pin to work with it. Grease a 9″ spring form pan. Roll out half of the dough and place it in the bottom of the pan. There is a good chance you’ll have to patch holes with this so don’t be discouraged. Press the dough up the sides a bit. Slice a couple of apples and layer them round the middle. Sprinkle brown sugar over the apples. Roll out the rest of the dough and place over the apples. Brush with a beaten egg. Bake for 40 minutes or so until the dough is cooked and a nice golden colour. Good luck waiting until this cools. Slice and serve. I am a happy camper. We had a decent storm blow through last night. As it pushed through it took the humidity with it. Ahhh. We turned our air conditioners off and threw open the windows. Fingers crossed the worst of the summer heat is behind us. I was saying to my husband this morning that I am very ready for cool weather comfort foods. Though in about 5 months I’ll be dying for a salad. And the cycle continues! A few days ago as I was cooking the Italian Burgers I realised I hadn’t set up the breakfasts for the week for the kids. So I needed something quick. We had frozen gooseberries to use and the kids love muffins so I whipped up a batch. I did defrost the berries and let them drain so the muffins wouldn’t get soggy. I used the recipe for the base of the muffin that is in the Pillsbury’s Complete Book of Baking. Preheat the oven to 400F/205C. In a bowl add 2 cups flour, 1/2 cup sugar, 3 teaspoons of baking powder, and 1/2 a teaspoon of salt. In a separate bowl, mix 3/4 cup of milk, 1/3 cup of oil, and 1 beaten egg. Add the wet ingredients to the dry ingredients all at once. Add the fruit and mix well. The trick is not to overwork the batter. It will be lumpy. That’s ok, just make sure the ingredients are incorporated. Spoon it evenly into 12 muffin cups. Sprinkle brown sugar over the tops of the batter. Bake for about 25 minutes, until the they are golden brown and a toothpick comes out clean when it you test the muffins. Delicious warm or for breakfast before school. And perfect for when you forget to make the school breakfasts in a timely manner! When we travel we try to learn a few phrases and bring a phrase book. Knowing please, thank you, where is the toilet, etc can go a long way. It certainly is better received than yelling louder in English. Honestly, why do people do that? Right now my husband and I are learning French. Well, he’s reviewing it and I’m trying to learn it. Now I know English is very hard to learn, it is such a mish mash of languages from all the influences going back a few thousand years. I’m starting to think French isn’t that far behind in the level of difficulty of learning it. Questions have completely thrown me for a loop! And the proclivity for words having many different meanings that don’t connect. And plurals. Sigh, I learn best by hearing and plurals sound the same as singular! I am determined to get this because we’ll be in France this summer for a couple of weeks. I am going to do my best but I think my phrasebook will be by my side! I can not wait for the markets and the food. I’ll be cooking up a storm! I had mentioned a few months ago that my son had asked his friend’s mother to make pulled pork and he asked that I make it some time. Now that I have more time I thought I’d give it a try. To be honest I’ve never had a pulled pork sandwich. But they look delicious. This is an all day affair so in the morning prepare the dry rub. This can be done the day before as well to let the pork sit overnight. I found an hour to be enough. In a small bowl mix 4 tablespoons brown sugar, 1 tablespoon of chili powder, 2 tsp cumin, 1 tsp of onion powder, 1 tsp of garlic powder, and some sea salt. Prep the pork. I got a 2 pound pork shoulder. The connective tissue on the outside needs to be removed prior to cooking. Mix the dry rub well and rub it all over the pork making sure everything is covered. Chill for an hour at least. Preheat the oven to 300F/150C. Prior to cooking spread some mustard on the pork. I used my homemade mustard which is super easy to make. Then add about 3/4 cup of ale. We used our Irish copper ale we homebrewed. Cover and slow cook in the oven for about 6 hours. After a couple of hours baste the pork every hour. The goal is to have it falling apart but still moist. Nothing worse than stringy dry meat! Pull the pork with forks to shred it completely and put it into a pot. 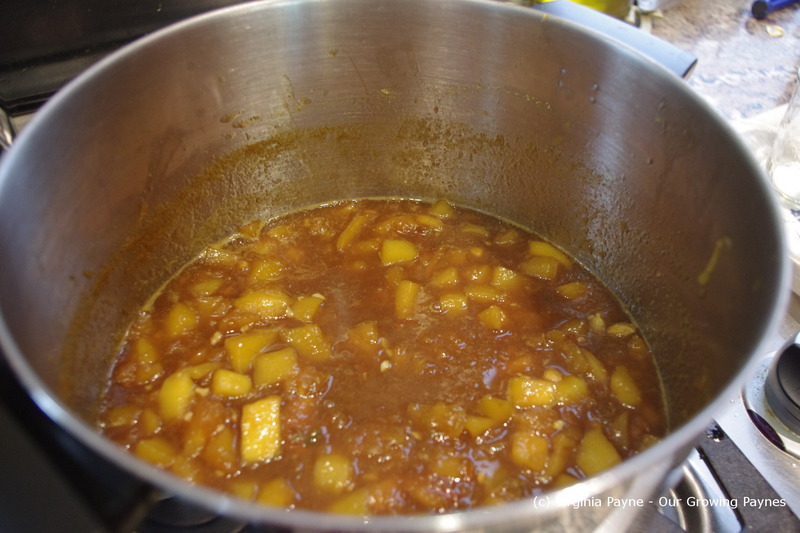 For the BBQ sauce I used the last of the Peach BBQ Sauce I made last year. Time to make another batch! Add enough to coat the meat without it being soupy. While this is warming through pickle red onion in apple cider vinegar. The onions lend a wonderful brightness to the pork. For the bread I found some local brioche that we warmed up in the microwave. Layer the pork with shredded cheese and the onion. If you would like add a dollop of sour cream. Because I couldn’t have the bread I had my dish in a bowl with the sour cream. Delicious! Ah the best laid plans. My favourite holiday, Thanksgiving, is tomorrow but Mother Nature has different plans for us. Because we have family coming from different states we decided, to be safe, to have Thanksgiving on Friday after the storm has passed through and the roads are clear. It’s our first proper snow storm of the season, I think the most we’ve had is a dusting, and we are looking at 8-12 inches when it’s all finished. Problem is, despite most of us living here for years, a lot of people suddenly act like they have never seen a snow flake and don’t know how to drive in it! So I am glad to be tucked away at home for the rest of the day. It is a very pretty storm with all the trees and shrubs outlined in snow. Hopefully I’ll have a chance tomorrow to take some pictures. Just because there is a snow delay doesn’t mean I don’t have a load of food prep ahead of me so I decided to make the cranberry sauce today. I got my inspiration from Chef Mimi and her Cran-Cherry Chutsauce. A fun name, isn’t it? What I loved about it was that it had port wine in it. Ooh, I thought, that’s a lovely idea. My version is with raisins and a Late Bottled Vintage port. This took less than 15 minutes to make and homemade is so much better than the canned sauce. In a small saucepan I added about 1 1/2 cup of whole cranberries and 1/3 of a cup of the port to start and brought that to a simmer. Chop a quarter of a red onion. Make sure the onion is finely chopped for this. Add 1/4 – 1/3 of a cup of seedless raisins. I added more than that forgetting the raisins will swell up so I removed a bunch. Then add the onion. Keep simmering until the cranberries start to burst. You’ll hear a popping sound. Once they have started to burst add brown sugar a tablespoon at a time. All told I probably used 2 tablespoons added a bit at a time. If it starts to get too stiff add more port a bit at a time. While this starts to thicken add a teaspoon of fresh thyme and stir well. Once you get the consistency and flavour you desire remove from the heat. I love the silverware from the Victorian era. This spoon was specifically made for jellies and cranberry sauce and has been in my family for several generations. They certainly knew how to lay a table. There are times I would love to live in other climes. If they got rid of the excessive heat and humidity. My mum used to head down to Florida as a child in the early 50’s. I can’t imagine the heat in the car all the way down the east coast without A/C. But when she got there Grammy Kevin had mango trees. What a treat that must have been fresh off the tree with the juice dripping. 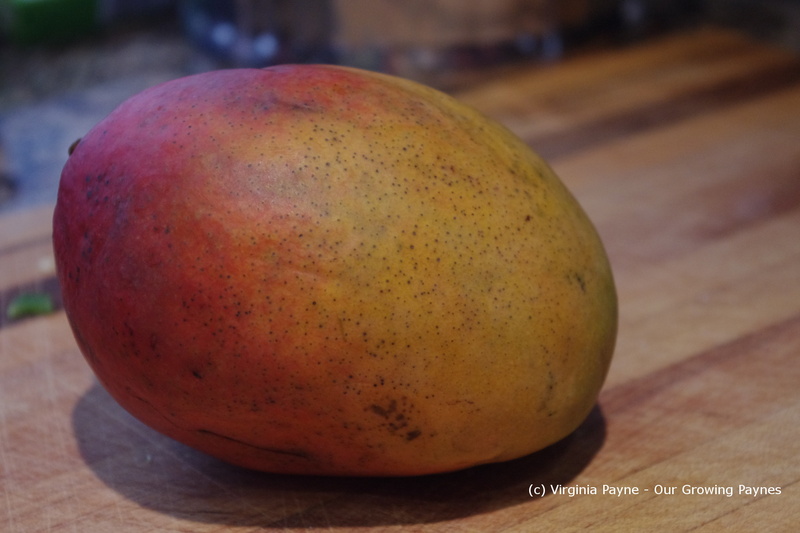 I love the sweetness of the mangoes but they go well with spice. It’s a great ingredient to work with. As I mentioned in the last post for hot pepper jelly my husband and I indulged in a kitchen day. We take the day to just create and enjoy being with each other. I love those days. 🙂 Our next treat was mango chutney. We got the recipe from the “Best Ever Curry Cookbook” by Mridula Baljekar. We’ve had some great meals from that cookbook. As with the hot pepper jelly it wasn’t difficult to make but the flavours are wonderful. To begin with you want as many fresh ingredients as you can find. We doubled the recipe so that is what I’ll tell you for this post. It made about 5 half pint jars worth. We found some really nice mangoes and fresh ginger yesterday at the co-op. 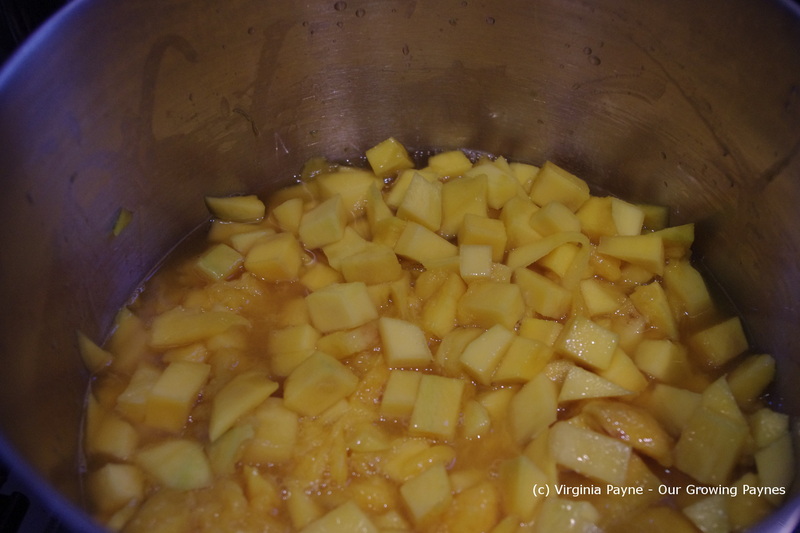 Cut 6 mangoes into chunks. If they are a bit firm that is ok. Heat in a large pot with 1 1/3 cup of apple cider vinegar. Cover and simmer over low heat for 10 minutes. In the mean time prep the other ingredients. 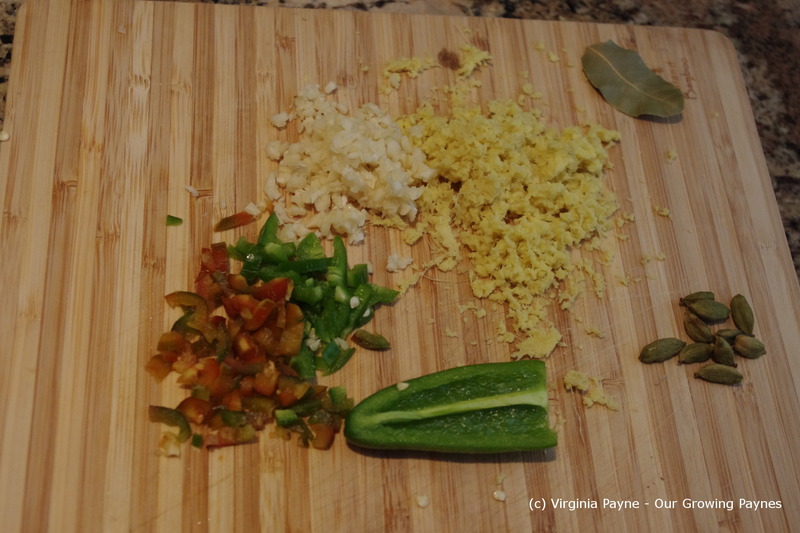 Finely chop 2-3 cloves of garlic, grate about 2″ of ginger, and finely chop two small hot peppers. We used jalapenos from our garden. My fingers burned for several hours with the pepper juice after all our recipes! Also, bruise 5 cardamom pods. The recipe also calls for 1/2 tsp of coriander seeds crushed but we didn’t have that so we used a bit of ground coriander. And you will need 1 bay leaf, 1/2 tsp salt, and 1 1/3 brown sugar. 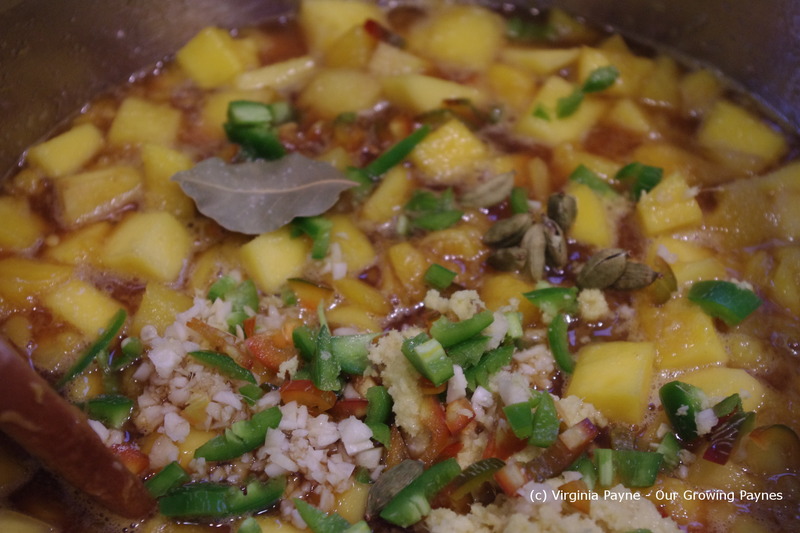 After the 10 minutes add all the ingredients to the mangoes and apple cider vinegar. Slowly bring to a boil then lower the heat and simmer for 30 minutes. Follow the standard jarring techniques. It did say to leave for a week before eating but we tasted it and it was amazing so it would be hard to wait a week!